What do you say to a parent who has lost a child. Even if that child is an adult it is a devastating loss. How can words comfort a brother or sister who lost a best friend or a wife who was looking forward to enjoying a quieter life with her spouse without the strain of jobs and children? And the children. What on earth do you say to the children who have lost a parent? Our neighbor passed away earlier this week. We haven't lived in the area long but had gotten to know Ron and Cindy a little. Ron had been fighting his battle with Cancer since we fist met him but he always had a good word and smile no matter how poorly he was feeling on any given day. As I sat down to write Cindy a note I realized, yet again, that I didn't know what to say. 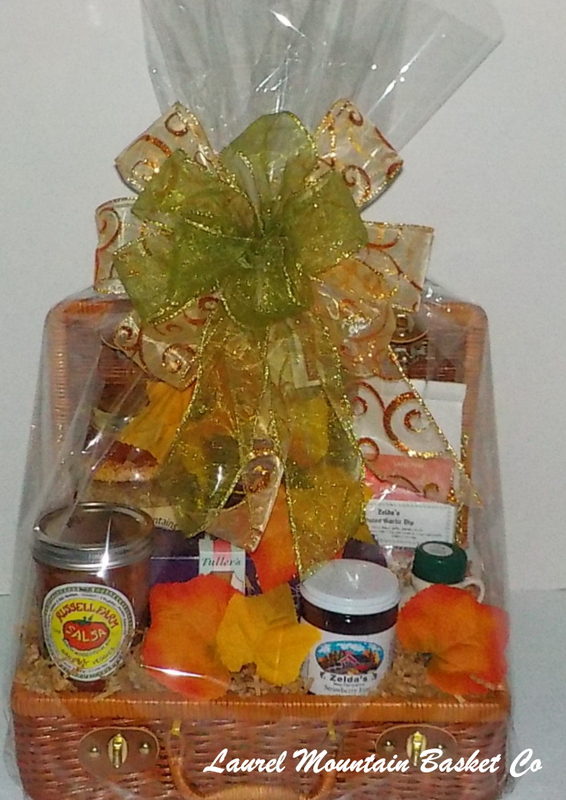 At Laurel Mountain Basket Company making and delivering sympathy gift baskets is a big part of our business. Often the sender will ask us for suggestions as to what to write on the care. “Thinking of you during this difficult time”, Keeping you and your family in our thoughts and prayers” or “With deepest sympathies” have always seemed appropriate but this time, they didn't work. I think it was because I was too close to the situation and was forgetting what condolence wishes are all about. 1. They are not about you, not about how you feel. They are not even about the person who has passed. Messages of sympathy are about the ones who are left behind. 2. Messages of sympathy are not about “fixing it”. There is nothing you can do or say that is going to take the pay and grief away. Time will change things but it is NOT your place to point that out. 3. Actions speak louder than words so if you are in a position to help, here are a few things you can do. 4. Remember that everyone grieves differently. Let them know you are there if they want to talk or if they would like your help but don't push or hover. Respect their need to grieve in their own way. 5. Offer to run errands or do chores like picking up people at the airport, baby sitting, cutting the grass, or picking up some groceries. 6. If you are not in a position to personally help out, send prepared meals or a gift basked filled with fruit or other easy to eat foods. 7. Don't question them about the details of the death. Sympathy may be one of the most difficult emotions to convey and there is not easy way to approach someone who has just suffered a significant loss. Offer what you can whether it is an ear to listen with or a shoulder to lean on. It will be the right thing. I am the owner and chief designer at Laurel Mountain Basket Co a full service gift basket company located in northern New Hampshire. I write several blogs including one by my alter ego and best friend, Zeva. Zeva is a blogging lab border collie mix who loves people and other dogs. Cats are okay too. She works with me running our gift basket service. She manages the pet gift department. She is all about pets and she tells it like it is.